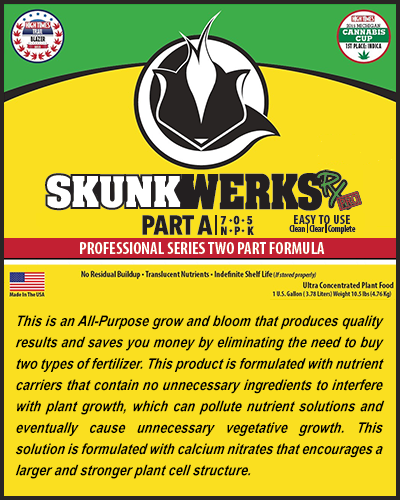 This is an All-Purpose grow and bloom that produces quality results and and saves you money by eliminating the need to buy two types of fertilizer. 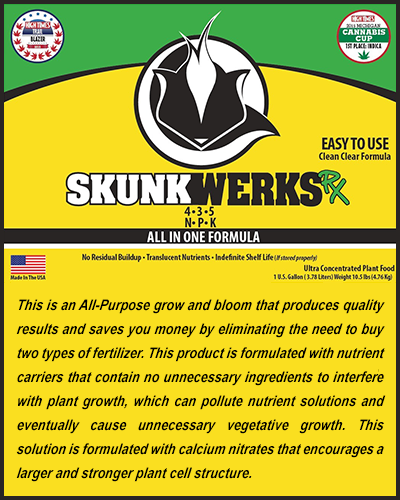 This product is formulated with nutrient carriers that contain no unnecessary ingredients to interfere with plant growth, which can pollute nutrient solutions and eventually cause unnecessary vegetative growth. This formula contains no CHLORIDE or SODIUM and is formulated with calcium nitrates that encourage a larger and stronger plant cell structure. Copyright @ 2017 Skunkwerks Rx. All Rights Reserved.